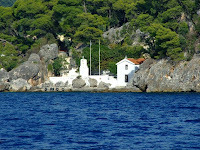 Lets be clear to start with - Parga is a tourist resort. If you are looking for the "real" Greece (whatever that means) then this is not the sleepy little fishing village where you will need your phrase book to hand to get by. 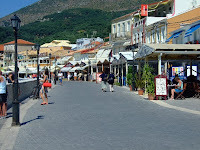 Tourism is the main business here so there are lots of souvenier shops, bars, tavernas and tourist offices offering trips to islands and local sites. Having said that Parga is the place I would have no hesitation in recommending to people as a wonderful introduction to Greece. Although a tourist resort it was a sizable town before the package tour was created so there is much of the original architecture still in evidence and the layout of the town is one that has evolved naturally. 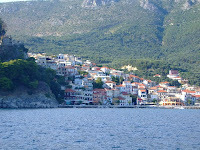 Parga nestles in the hills that slope down to three small coves. The first contains the harbour with a jetty from which the various tour boats dock and the water taxis run from. The second cove next to the harbour is the towns main beach and is a mixture of sand and shingle. It's fairly crowded with the sunbeds and parasols. 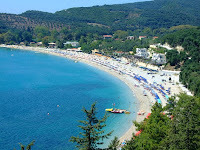 Both of these coves are lined by a promanade with lots of cafes, bars and tavernas mixed in with the souvenier shops and small mini markets and they look out onto a sprinkling of small islands which shelter the beach from the bigger waves. The larger island has a couple of chapels and the remains of an old fort on it and it is lit up at night creating beautiful views at night when eating or relaxing with a drink on the front. During the day too, the vista is a perfect backdrop as you sip a drink in the bars and people watch. The third cove is a small shingle beach hidden just around a large rock outcrop at the end of the main beach. You get to it down a small path and it's served by a single taverna. This is much quieter and ideal to get away from the bustle of the main town without having to go far. 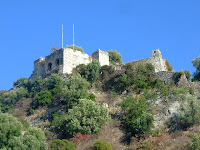 To the right of the harbour, a ruined Venetian castle overlooks the town which is free to enter and is well worth a walk round for the great views down on the town through the pine trees that have grow in and arround the castle walls. A restored building just inside the castle contains a cafe bar which is a lovely spot to spot for a drink or a bite to eat in tranquil surroundings. You can climb up to the castle following an alleyway the snakes it's way from the harbour front up the hillside. All the way up there are more bars with views out over the bay, and souvenier shops with an assortment of clothes, jewelery, wine & liquor, olive oil and preserved fruits etc. The town carries on past the castle entrance and onwards on the other side of the hill on which the castle sits, down to Valtos beach which is a mile of sandy beach with a couple of tavernas and bars with watersports. Getting over to Valtos is a pleasant stroll up over the hill and takes about 20 minutes to half and hour from Parga Town harbour at an amble pace. Going the other way out of Parga, following the road that runs from the main beach into the olive groves, you can continue up over the hill through a path the winds through the olive trees until in about a hour you decend through Lichnos town via a steep road switching back and forth down to Lichnos beach. This beach is the best for it's clean sand and quiet atmosphere. It makes for a pleasant day to strollover to Lichnos in the morning and then take the water taxi back to Parga Harbour in the afternoon. The water taxis run regularly to both Lichnos and Valtos beach from the harbour and only cost between 5 and ten euros. The town is a fairly large resort so you won't be in need of chemists, doctors, post offices, banks etc should you need them. There is at least 3 cashpoint machines within 20 yards or so of the main crossroads at the centre of town and there's even 2 dentist surgeries in town - I know this having managed to break as tooth and need treatment while out here. Parga has much to offer as a resort with the castle, the views, the shops in the twisting alleyways of the old town and the many bars and tavernas. It seems to have a little bit of everywhere else in Greece which is why it's one resort which will have me returning again and again. 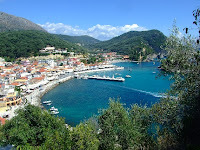 You can find out more about the resort and get a wide variety of views and lots of photos from http://www.parga.com/.